Well, its graduation time again in Okinawa. The Japanese fiscal and school years run from April 1st to March 31st. The eternal cycle of watching our children and students “our kids” grow up with the daily triumphs and struggles of school. E. Heinrich-Sanchez introduces TEDxSapporo and “Karate Kid Concepts” to students before graduation. “Hope Invites” talk by Tsutomu Uematsu inspires as we mark 4 years after the Tohoku Tsunami. The latest key word on the lips of educators is “Global Citizenship”. How can we raise our kids to become the global leaders of the future? Global starts where we stand, live and play. Global starts at home and school. Before we take a step out into the world, do we really know who we are and about our own island history? While in the USA people are raving about the movie “SELMA” and most Japanese know about Martin Luther King, local history is fuzzy and getting more diluted as official policies forge on to eliminate the so called “masochistic” view of history. “Japan fought a war of aggression. It did really dreadful things. It’s clear,” Kitaoka told a symposium in Tokyo on Monday, according to the Asahi Shimbun. Historical keywords like “Auschwitz” or “Anne Frank” need to be on the same level of awareness as “Unit 731” among others. March 10th also marked the memorial for those burned to death in the US fire bombings of Tokyo. Before we enter into the 22nd century, it might be a good time for ALL countries who were involved in WW2 and the Asia-Pacific War to look back and take another body count as atrocities are on all sides. I was surprised to have learned that Stanford University has a “Forgiveness Project” led by Dr. Fred Luskin. In order to move forward, we need to forgive. Before forgiveness can take root, the killing fields need to have healthy doses of remorse and self-reflection. In August, Prime Minister Abe is scheduled to make an official statement regarding the 70th anniversary of the Asia-Pacific/WW2. The world will pause for his statement as it will color the future relations in the region. What position is the US and the US Forces Japan taking on this issue? Are key people in the US Forces Japan helping or hindering taking into consideration controversial public statements and appearances recently in the news. We need a new platform to look back in order to build confidence for the future. Our new global leaders need to have critical thinking skills and the ability to debate. What is their starting point? History cannot be wiped clean. Lessons need to be learned, not repeated. What would Ernie Pyle say about this? Oliver Stone together with Peter Kuznick produced a series revisiting the US role in the past century titled: “Untold History of the United States”. 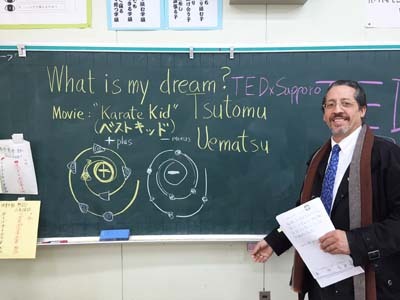 Yesterday, I introduced students to a fabulous TEDxSapporo talk by entrepreneur Tsutomu Uematsu. His mission is to make the Japanese phrase “DO SEI MURI” in other words, “any way its just impossible” or “…don’t even think you will succeed”. Humans need confidence and hope to find meaning in life and move forward. Sometimes what a teacher or parent will say to a child can come down like a sledgehammer shattering confidence and motivation. Uematsu suggests that when someone speaks these words to not lose hope but to think of alternatives or possible solutions. Nothing is impossible. His talk is in Japanese with sub-titles soon to be available. For those bi-lingual parents and teachers, please consider showing this moving TEDx talk for those who are graduating and to inspire those moving up a grade. We need confidence and hope that we can forge a prosperous and pacific age towards the next century. Next week: Some good books to add to the Commandants List of suggested reading.